the membership page to join. Thanks. Merrimack Valley Paddlers Boat Rental List. Cockpit Size: 36" x 20"
In its time the Cruise Control was considered a hard-playing boat that was extremely responsive. It is a creeking boat with squirt-like abilities. The generous size of the Cruise Control Control accommodates people up to 240 pounds while serving as a superior creeking boat for those under 180 pounds. Cockpit Size: 32" x 18"
Originally a radical design, one of the first boats used to complete outstanding flat spins, wave wheels and high-speed action. Unforgiving boat for beginners, hard boat to learn in. Too long for rodeo moves, not a boat to stay dry in. No tracking ability well despite length; hard to make boat go straight. The same properties that make it difficult to control for beginners make it highly responsive and a pure pleasure for paddlers with intermediate or advanced skills. The smallest paddle strokes create an immediate and definite responce from the boat, giving the paddler great control. The Twister excells at anything that requires fancy and/or precise moves. Great surfing ability, doing spin moves or just rapidly changing direction. An obsolete design, this is the whitewater kayak that became a legend in the industry. At the time it revolutionized kayak design. It became one of the most popular kayaks ever produced. Shoft chines and high bow buoyancy translate into incredible stability and predictability, even when punching through meaty holes and big standing waves. The Crossfile is the choice for many big water paddlers who want a forgiving design and more storage capacity than lower volume designs. Handles well, highly maneuverable, light, rolls easily, has a good feel to it. A good boat for stability and for fun in the surf. Doesn't track, not for beginners— little initial stability, not for staying dry. It will not paddle in a straight line for anyone but an experienced paddler. It is great in the surf, durable and heavy enough to hold its own in big waves. A large, stable multi-purpose canoe. Primarily used for canoe tripping on lakes, flatwater, and class II-III whitewater. Huge capacity holds an entire months worth of gear; this is a great boat for that Alligash or Northern Forest Canoe Trail trip. Equipment: No float bags, 2 paddles, 1 PFD. The ThrillSeeker is a high performance inflatable kayak. The air floor and tapered side tubes make the boat at home on anything from big water to technical rivers. If you've never been in a boat before, this is the boat to start with; the paddler sits more inside the boat and feels more secure then the other inflatables. This boat has the most room for gear of all the MVP solo inflatables. Equipment: 1 pump, helmet, PFD, paddle, mesh bag (was 2 pumps). Recommended for intermediate to advanced paddlers, the Force series boats are designed to mimic the maneuverability of hard shell kayaks, while providing the security and safety of an inflatable kayak. These boats can surf, perform enders, do flat spins, and complete Eskimo rolls. Adjustable back and foot rests come standard. The Force is recommended for intermediate to advanced boaters under 185 pounds. The Force includes thigh straps to enhance control while surfing, rolling and completing tricks. It is a great boat for paddlers who want to move 'up' a class in the water they run. Equipment Included: Pump, Paddle, PFD, Helmet, and possibly gear bag?. Equipment Included: 3 paddles, ??? helmets, ??? PDF's, pump, pump bag, repair kit, throw bag, gear bag. Serial #: ?, US Coast Guarg Reg #: ? Another fun, stable tandem catacraft. Equipment included: 8 paddles (incl 1 guide paddle), 10 helmets (incl 2 children's), 6 PFD's (2 small, 2 medium, 2 large, 1 ML); throw bag, flip line, large pump, and gear bag. Note: Paddler capacity is normally two per thwart (one on each side) plus guide. With third thward added capacity is seven. You can squeeze a second person on the back in the guide's position as long as weight capacity is not exceeded. Withe 3 center thwards and more inside room, the NRS raft holds more people and gear then the Star raft and as such is great for family outings. However with smaller tubes it doesn't perform as well in bigger water. Note: Paddler capacity is normally two per thwart (one on each side) plus guide. With two thwarts the normal capacity is five people. You can squeeze a second person on the back in the guide's position as long as weight capacity is not exceeded. 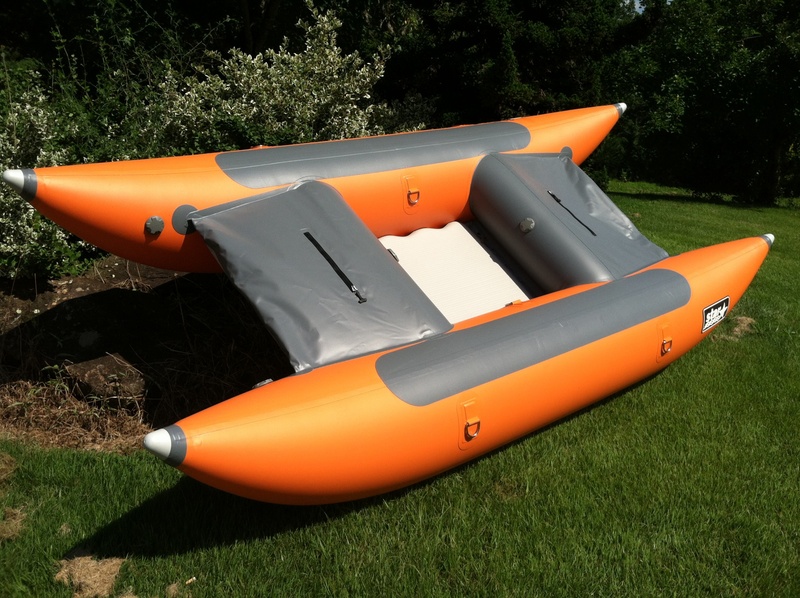 The Star raft has only two thwarts and bigger side tubes then the NRS raft for higher flotation and handling in bigger water. Put 4-5 experienced paddlers in it and it is one hot boat. However the larger tubes make it more cramped. An oversize inner-tube. Designed to tip over in the slightest current. Note: This boat is really not for rent. We're crazy; but not *that* crazy. It's only listed here as a way to test the rental and payment code. Didn't see the boat you wanted? One of our sister organizations, the NH Paddlers Chapter of the AMC also has a large rental fleet (mostly canoes, but some kayaks, sea kayaks, and inflatables. Go here for their list. The AMC Boston Paddlers likewise rents whitewater (and other) boats, go here for that list. Note that AMC Boston rentals have trip participation restrictions. Only paid up members can rent gear; although we allow club members to rent gear for friends and family. The renter is responsible for ensuring gear is returned to the custodian in a timely manner so the next member can rent the gear. Renter to renter transfer is okay as long as the custodian and equipment manager (Jeff Swett) are aware that is what is happening. We may also request renter to renter transfer to help ensure as many people as possible can take advantage of this club benefit. Equipment may NOT Be Available During Major Club Events. During major club events (ie, Pig Roast, Dead Family Weekend, etc,) club equipment may be allocated for general use and not be available for rental. Additionally reservations made ahead of time which conflict with club events are subject to cancellation. We try to store equipment at a central location to make it easier for all. Generally, the accessories, paddles, etc, for each rental craft is with the craft custodian. Please call the custodian (at a reasonable hour) regarding how to get the boat. Please note that equipment custodians are doing the club a favor by storing equipment. They are NOT a delivery service. Please make arrangements to pick-up gear a reasonable amount of time before needed; and also return the equipment promptly after use. Payment is required when reservation is made. The reservation form below will redirect you to PayPal where payment can be made. Reservations are first-come-first-served. The web site does not allow a boat to be "held" without payment. Prices are 1st day, then each subsequent day, rafts & tandem-catacraft are day, weekend, major holiday weekend, week, then monthly. Major holiday weekend rates apply Memorial Day, July 4th, Deerfield Fest Weekend, Labor Day, West Release Weekend, and Colombus Day. For advance reservations (one week or more in advance) the entire holiday weekend rate applies, even for single days. If it's less then one week until the rental and the craft has not been reserved yet then normal (ie, daily) rates apply. Rentals longer then two weeks require advance permission of Equipment Manager. Cancellations within one week of rental will result in a credit for a future rental with reservation confirmed no more then one week in advance of requested date. (ie, Last-minute cancellation—you get a free last-minute-reservation sometime later on.) See the Equipment Manager, Treasurer, or WebMaster to arrange this. If the gear is damaged please own up and point out the damage so we can make repairs so the gear can safely be used by the next renter. We recognize that gear may be damaged in the normal course of river running and that is to be expected, but if it appears that the damage is caused by negligence we expect you to be an adult and pay for repairs or replacement. This has not been a problem but we want to make clear our expectations. Outright loss of the equipment will result in a charge based upon the replacement cost of the craft less a percentage based upon the age. New boats (<1 year old) figure paying most of the cost of a new boat; for older boats as little as 1/3rd the replacement cost. Use of Club Equipment is at "Your Own Risk". The Merrimack Valley Paddlers does not warrant or guarantee the condition of any equipment rented or loaned. Each user is responsible for inspecting the equipment and deciding whether to use it on their own. By renting and/or using club equipment, each user agrees to indemnify, defend and hold harmless The Merrimack Valley Paddlers, and its officers, directors, partners, agents, members, employees and volunteers from and against all demands, claims, and damages to persons or property, losses and liabilities, including reasonable attorneyâ€™s fees arising out of or caused by the users' use of said equipment. Reservations or questions please contact the equipment manager (Skip): Email is “equipment at mvpclub dot org”. The Safety Requirements set forth are intended for members and guests using MVP equipment or participating in MVP activities. However we enourage all members to review and comply with these guidelines. Renters of MVP supplied boats, equipment, and other property must also read, agree to, and sign the MVP Equipment Rental Waiver and Release of Liability. All property damage (whether to MVP equipment or not), and any injuries requiring medical assistance must be reported to the MVP Board as soon as possible. The MVP Strongly encourages its members to attend and become certified in training to enhance safety on the river. This would include (but not be limited to) First Aid, CPR, Swiftwater Safety and Rescue, and other applicable courses. All participants in MVP sponsored activities must wear properly-fitting U.S. Coast Guard-approved lifejackets (Personal Flotation Devices, or PFDs) at all times during on-water activities except Pool sessions where a certified lifeguard is present or for stand-up paddleboards operating within the surf zone. All MVP rentals include PFDs (with whistles) and paddles for anyone who does not have their own. All lifejackets must be in serviceable condition. USCG-approved Inflatable lifejackets are acceptable for activities that do not involve paddling in surf zones or on whitewater rated at Class I or above. Inflatable lifejackets provide a useful alternative for flat-water paddling in hot weather. Stand Up Paddleboards: The U.S. Coast Guard has determined that Stand Up Paddleboards operating outside the surf zone are “vessels” for purposes of the USCG regulations, and therefore must carry one lifejacket for each person on board. In addition, the ACA requires persons using Stand Up Paddleboards at ACA-insured events (ie, MVP Events) to wear their lifejackets at all times while on the water. All MVP boats include a first aid kit and throw bag in a dry bag that MUST be carried on the boat while on the water. Appropriate clothing: All participants must be dressed in clothing appropriate for the venue and conditions of the activity. Participants should always be prepared to get wet, flip over or go into the water. In particular, if the water temperature is less than 60°F, and/or the combined air and water temperature is less than 120°F, participants must wear wetsuits, dry suits or other acceptable clothing. Alcohol or Drugs: Participants should not consume or be under the influence of any alcohol or any drugs (legal or illegal) that may impair the judgement or abilities immediately before or during an on-water activity or events. ACA rules require the MVP to disqualify any participant under the influence of alcohol or drugs from participation and ask them to leave immediately. Individual participants should know their skill levels, and should avoid conditions for which they are not prepared. Trip leaders should be prepared to question new participants to verify their abilities. Paddling Alone: The MVP's ACA Insurance covers group paddling activities only. Anyone who ventures off by themselves is considered no-longer part of the MVP Group. Participants must wear properly-fitting paddling helmets (in class II and above). Bicycle, football, hockey or other helmets are not acceptable. Participant must have an appropriate level of additional flotation in their boats for the venue. For groups of up to 10 participants, there must be at least two (2) throw-ropes. For groups of more than 10 participants, there must be one (1) throw-rope for every five participants. Groups of up to eight (8) participants must carry at least two (2) throw ropes. Groups larger than eight (8) participants must carry at one (1) throw rope for every four (4) participants. Participants must outfit their boats with additional flotation appropriate for the venue. Participants must have a minimum of one bilge pump or bailer for every two (2) boats. Each participant boat must have a bilge pump or bailer. Each kayak must have a paddle float. Marine VHF Radio (minimum of one per group). Kayak ramps, slides, or other jumping or sliding structures are NOT covered by MVP's ACA Insurance unless prior express written permission is obtained. 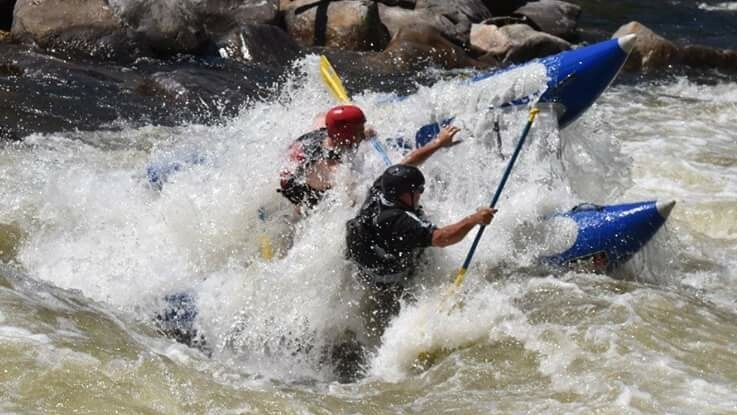 Any downriver or up river whitewater race that has a direct head-to-head race component to it that could either specifically, or loosely, be described as a 'boatercross style of event' requires additional safety considerations and prior written permission from the ACA National Office. Trip leaders and activity coordinators should know the skill levels required for the activity they are organizing, and should use reasonable screening techniques to ensure that participants have the skills necessary for the activity. To avoid awkward situations, coordinators should disclose skills requirements to potential participants before they travel to participate in an activity. Make sure each participant brings adequate food and water for the activity. During the activity, make sure participants stay well-hydrated, and eat enough food to maintain their energy levels. For groups larger then five boats, designate "lead boat" to set the pace, and a "sweep boat" to bring up the rear and make sure the group does not lose stragglers. During the trip, leaders should set a reasonable pace so everyone can stay together. Recognize when group members are tired or having difficulty and adjust the group?s pace accordingly. Leaders should constantly scan, and be prepared for changing weather conditions. Before any trip activity begins, a float plan with trip details should be left with someone who is not participating. Before putting on, trip leaders should verify there are no loose ropes in or dangling from boats, since these ropes can rapidly become entrapment hazards. Do not tie any person in or to a boat. Identifies the location of safety equipment (first aid kits, pin kits, repair equipment, etc). Which individuals are trained in first aid and/or CPR. Prepare the group for the challenges of communicating effectively while on the water, a review of hand and whistle signals should be performed. Advise the group if there are any known dangers (strainers, dams, difficult rapids, etc) and how to locate them. Remind boaters not to pass the lead boat nor to fall behind the sweep. To always keep the boat behind them in sight (if the boat behind stops, then stop also). Remind participants, particularly novices, to not stand up in boats, and to avoid weight shifts that may cause capsize. The MVP's ACA-provided Insurance has additional requirements for large events. Review the current ACA guidelines for further info. Please check this list before making a reservation to be sure the boat you want is not already reserved. Thanks. Rental equipment may be picked up as early as the day before the first paid rental day. It is due back no later then the day after the last paid rental day. We trust our members to be on the honor system to reserve and pay for each day the boat is used. Our insurance carriers now require a release form be signed by all renters. This only has to be done once-per-year and can be completed entire online. Go here to download/upload the liability waiver form. Fill out this form to reserve a boat. You must be a current-year paid member. Please fill in the required fields; when you are done then click the "reserve" button below. You will be taken to a page which allows equipment rental payments using PayPal. These are the days you PAY for. Equipment may be picked up the day before the first paid rental day. Due back no later then the day after the last paid rental day. Other arrangements send email. If you mailed a check in advance, enter the payment code the treasurer gave you. Name, email, and phone number all must match the MVP's membership database..
You will be emailed a reservation confirmation. Enter any comments or other info about this rental. Click "Reserve" to be passed to PayPal for payment and to complete the reservation. By renting or borrowing equipment from the MVP, I certify that I have read and agree to the terms and conditions outlined in the "Rental Policies & Procedures" section above.